San Francisco may not be as open to saving salmon as you would think. When it comes to jockeying over California's scarce water resources, San Francisco has allied itself with conservative agricultural districts in the Central Valley instead of environmental groups. As the state's water officials get ready to approve a plan to reallocate water resources and reach farther upstream from the delta, San Francisco has been pulled into the water wars like never before. 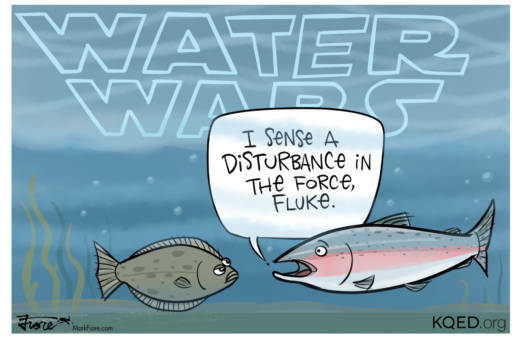 Cartoonist's Note to anglers: The fish depicted in this cartoon is really a California Halibut, Paralichthys californicus. "Fluke" is just his nickname since Paralichthys dentatus, commonly known as fluke, is a species found in the Atlantic Ocean.